This weekend I built a canoe and kayak rack for my lake house property. Prior to the rack I just left the kayak sitting on the deck and the canoe lying on the ground. Consequently the kayak took up precious room on the deck and the canoe was always dirty. Now they are neatly stacked and ready for use. It cost me about $60 in material and about two hours of work. All I used was an eight foot length of 4”x6” pressure treated lumber for the side posts, a couple of 10 foot lengths of 2”x6”s, and two 10 foot long 1”x4”s, again all pressure treated. I used galvanized carriage bolts, along with nuts and washers, and a few deck screws to assemble it. The 2”x6” boards were used to form the legs and arms. The 1”x4”s were used for cross bracing to connect the two end posts together. To ensure a rugged design I made lap joints on the 4”x6” end posts that the 2”x6” legs and arms mounted flush into. 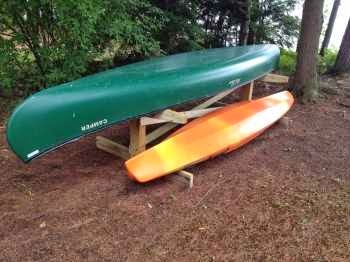 I will be writing up a full description of the construction of my canoe and kayak rack, along with a short video, and will be posting them on HomeAdditionPlus.com. So make sure to check it out. The article and video should be live on HomeAdditionPlus.com within the next week.